Free stuff, of course, so welcome to MovieGallery.com’s weekly giveaway! Last week we gave away a Napoleon Dynamite prize pack, and we can only assume it won’t be too long before Head Knocker Kip is bobbing his head in time to Jamiroquai while the lucky winner practices their sweet moves on their brand new Learn-to-Dance kit! 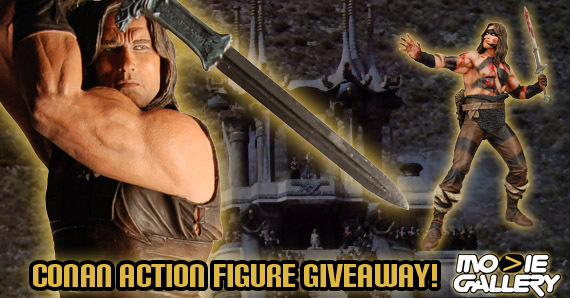 This week we’re giving away a pair of incredible Conan the Barbarian 7″ action figures! And we’re not talking Khal Drogo in the third dimension here, we mean the original Arnold “McBain” Schwarzenegger in all his bicep-y glory! Keep reading to enter for the chance to make these figures yours! Thief. Warrior. Gladiator. King. He is… Conan the Barbarian! These detailed figures are entirely accurate to specific scenes from the classic sword-and-sorcery movie. Nursed back to health by the wizard Akiro, Conan sets off with his friends Subotai and Valeria to rescue King Osric’s daughter from the Snake Cult. 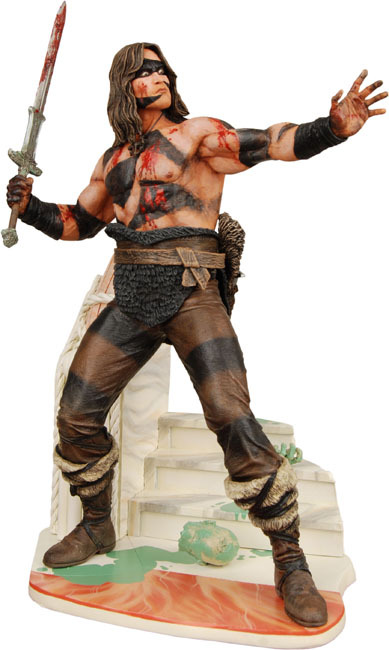 This fully articulated, 7″ scale figure shows a camouflaged Conan infiltrating the Mountain of Power. It comes with Atlantean sword, stewed head and hand, and a diorama base. Ages 18+. During his travels, Conan befriends two thieves, Subotai and Valeria, and together they set out for the Temple of the Serpent. This 7″ scale figure shows Conan as they are infiltrating the Temple to discover the connection between the Cult and Thulsa Doom. Ages 18+. This entry was posted in Contests & Giveaways and tagged arnold schwarzenegger, conan the barbarian, conan the barbarian giveaway, giveaways by mgadmin. Bookmark the permalink.